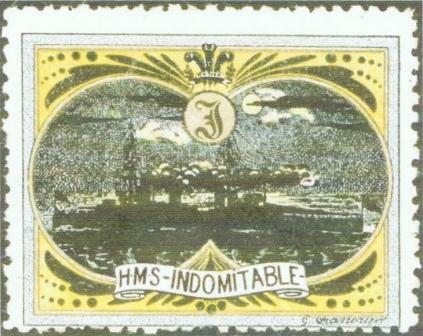 HMS Indomitable was an Invincible-class battlecruiser of the British Royal Navy. She was built before World War I and had an active career during the war. She tried to hunt down the German ships Goeben and Breslau in the Mediterranean when war broke out and bombarded Turkish fortifications protecting the Dardanelles even before the British declared war on Turkey. 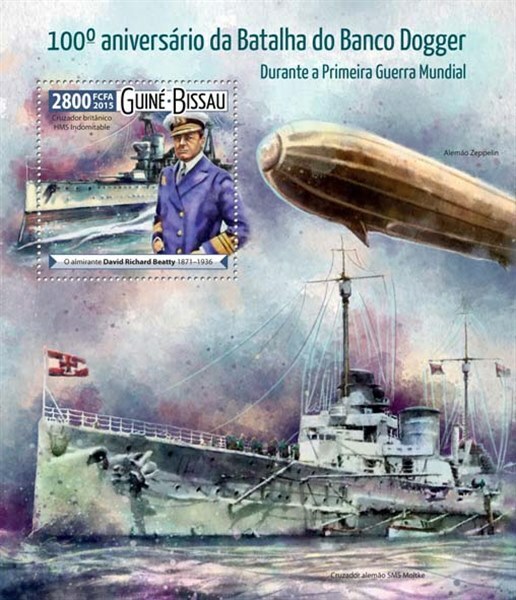 She helped to sink the German armoured cruiser Blücher during the Battle of Dogger Bank in 1915 and towed the damaged British battlecruiser Lion to safety after the battle. She damaged the German battlecruisers Seydlitz and Derfflinger during the Battle of Jutland and watched her sister Invincible explode. She was deemed obsolete after the war and was sold for scrap in 1921. The Invincible class ships were formally known as armoured cruisers until 1911 when they were redesignated as battlecruisers by an Admiralty order of 24 November 1911. Unofficially a number of designations were used until then, including cruiser-battleship, dreadnought cruiser and battle-cruiser. Indomitable was significantly larger than her armoured cruiser predecessors of the Minotaur class. She had an overall length of 567 ft (173 m), a beam of 78 ft 7.75 in (23.9713 m), and a draft of 30 ft (9.1 m) at deep load. She displaced 17,250 long tons (17,530 t) at load and 20,420 long tons (20,750 t) at deep load, nearly 3,000 long tons (3,000 t) more than the earlier ships. Indomitable had two paired sets of Parsons direct-drive turbines. The two sets, each with a condenser, were housed in port and starboard engine-rooms separated by a longitudinal bulkhead. The high-pressure ahead and astern turbines drove the outboard shafts and the low-pressure ahead and astern turbines drove the inner shafts. A cruising turbine was also coupled to each inner shaft; these were not used often and were eventually disconnected. The turbines were designed to produce a total of 41,000 shaft horsepower (31,000 kW), but reached nearly 48,000 shp (36,000 kW) during trials in 1908. Indomitable was designed for 25 knots (46 km/h), but reached 26.1 knots (48 km/h) during trials. She maintained an average speed of 25.3 knots (47 km/h) for three days during a passage of the North Atlantic in August 1908. Indomitable's three-bladed propellers were 10 feet 6 inches (3.20 m) in diameter on the inner shafts and 9 feet 6 inches (2.90 m) in diameter on the outer shafts. The steam plant comprised 31 Babcock and Wilcox water-tube boilers arranged in four boiler rooms. Maximum bunkerage was 3,083 long tons (3,132 t) of coal, and an additional 713 long tons (724 t) of fuel oil that was to be sprayed on the coal to increase its burn rate. At full fuel capacity, she could steam for 3,090 nautical miles (5,720 km) at a speed of 10 knots (19 km/h). Indomitable mounted eight BL 12-inch (304.8 mm) Mk X guns in four twin hydraulically powered turrets. Her secondary armament consisted of sixteen 4 in (102 mm) QF Mk III guns. During 1915 the turret roof guns were transferred to the superstructure and the total number of guns was reduced to twelve. All of the remaining guns were enclosed in casemates and given blast shields at that time to better protect the gun crews from weather and enemy action. The QF Mk III guns were replaced by twelve 4-inch BL MK VII guns on PVI mountings during 1917. Her anti-aircraft armament consisted of a single QF 3 inch 20 cwt AA gun on a high-angle MKII mount at the aft end of the superstructure that was carried from July 1915. A 3-pounder Hotchkiss gun on a high-angle MkIc mounting with a maximum elevation of 60° was also mounted in November 1914 and used until August 1917. A 4-inch BL MK VII on a HA MkII mount was added in April 1917. Five 18-inch (450-mm) submerged torpedo tubes were fitted on the Invincibles, two on each side and one in the stern. Fourteen torpedoes were carried for them. The armour protection given to the Invincibles was heavier than that of the Minotaurs—their waterline belt measured 6 inches (152 mm) amidships in contrast to the 4 inches (102 mm) belt of their predecessors. The belt was 6 inches thick roughly between the fore and aft 12-inch gun turrets, but was reduced to four inches from the fore turret to the bow, but did not extend aft of the rear turret. The gun turrets and barbettes were protected by 7 in (178 mm) of armour, except for the turret roofs which used 3 in (76 mm) of Krupp non-cemented armour (KNC). The thickness of the main deck was 1–2 in (25–51 mm) and the lower deck armour was 1.5–2.5 in (38–64 mm). Mild steel torpedo bulkheads of 2.5-inch thickness were fitted abreast the magazines and shell rooms. She was built by Fairfield Shipbuilding & Engineering Co. Ltd, at Govan. She was laid down on 1 March 1906 and launched on 26 June 1907. She was commissioned on 20 June 1908 before she was fully complete to carry the Prince of Wales to Canada. De Landre label from Peter Crichton. GUINE-BISSAU 2015 2800 FCFA sgMS?, scott?